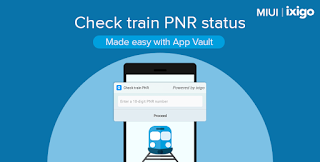 New Delhi, July 26, 2018: ixigo, India’s leading travel marketplace, has announced their partnership with Xiaomi, India’s number 1 smartphone brand owing to which train travelers will now be able to check the PNR status of their train bookings on their Xiaomi smartphones, even without downloading the ixigo app. Millions of Xiaomi India MIUI users will be able to preview the ixigo widget on the minus 1 screen of their Xiaomi smartphones, where they can input their train PNR numbers. Users will be able to view the status of their train, in just one single tap. Bringing together ixigo’s large customer base and Xiaomi’s unconventional MIUI, this service aims to further simplify the lives of Indian train travelers, especially in tier 2 and 3 cities. Raghu Reddy, Head of Categories and Online sales, Xiaomi India further added, "Xiaomi's journey started with MIUI when we wanted to launch the most immersive and innovative operating software for millions of users. Today, MIUI has over 190 million users and we continue to make it more relevant in every market we are present in. The partnership with ixigo is a step in that direction and we hope it will enhance the user experience for all our customers"
Loved by over 100 million travelers, the ixigo trains app can be found on every second smartphone in the tier 2 and 3 city segment. The app is a single app that caters to everything related to train travel. One can search, check availability, book and manage their trip, all within the same app. The app is available in 8 vernacular languages - English, Hindi, Marathi, Gujarati, Bengali, Telugu, Tamil & Kannada, covering over 80% of India’s digital user base.